The Christmas and holiday season is upon us. If you’re like many, there are time honored traditions visible in most corners of your home. From the fresh cut Christmas tree to the twinkly lights to the masses of sweet confections. It’s an exciting time for all of us. Not unlike having a toddler in the house, extra precautions are needed. The hazards of Christmas decorations for pets may not be immediately obvious. With a little preparation and consideration this holiday season is sure to be festive. The Christmas tree, decorated from head to toe, feels magical to some. The smell of fresh pine and the twinkling of the lights can mesmerize and delight. Until your pets get a hold of it, that is. With an innate desire to chew on sticks and twigs, your pup may seek out the perfect branches for a snack. While this may seem harmless, did you know that oils from a fir tree can be quite irritating to mouth tissue? It can cause excessive drooling and even vomiting. Even more hazardous are the needles of the tree if ingested. If consumed in enough quantity they can puncture the lining of the intestines. Worse, the needles can create a blockage in your pet’s intestinal tract. Both can have serious consequences. We recommend keeping an eye on your pets while the tree is in your home. If you live in an area like Arizona that doesn’t get a lot of snow, you may be tempted to bring a flocked tree home. Flocking is a process that deposits small fibers onto branches to simulate the look of snow. Beware that if Fido starts to nibble and ingests too much flocking, he could become quite ill.
There’s one more item to be conscious of with a fresh tree. Many of them are treated with chemicals to extend their life span after being cut. These chemicals can seep into the water supply in your tree stand. When Fluffy gets thirsty and sneaks a sip from the tree (which looks like a big water bowl to her) she may be ingesting poison. No Christmas tree is complete without a bounty of beautiful lights. Whether you’re an all-white-lights kind of person, or prefer blinking multi-colored lights, every tree comes alive with them. Your pets couldn’t agree more. For whatever reason, many pets are drawn to the cords of lights. Whether they are on your tree, mantle, or around a door frame, pets are intrigued. Did you know that electrocution from chewing on cords is the most common form or electrical injury for pets. Electrocution, as it sounds, is quite painful. It can cause burning and scaring of the mouth and surrounding tissue and hair. Some animals even experience long-term complications from injuries sustained during cord chewing. If you have a pet that likes to chew, we suggest keeping lights up and away from their reach. Even if you think you can trust your pet, it is wise to periodically check cords for chew marks. 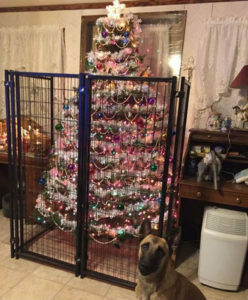 Or, an extreme alternative that we’ve seen is placing a cage around your tree. This may dampen the Christmas mood a bit, however. Bringing out your favorite decorations from years gone by can be a tricky prospect with a tail wagging pup or a cat that can leap tall buildings in a single bound. If you need to scale back this year because of a new family member, here are a few alternatives that are safe and mostly pet proof. If you have questions about Christmas decorations for pets or general questions about pet care, you can contact Kara Jenkins, Owner of TLC Pet Sitter. We are also available by email at info@tlcpetsitter.com.